Tuna watch: Look for troll- or pole-caught fresh or canned albacore from the United States. 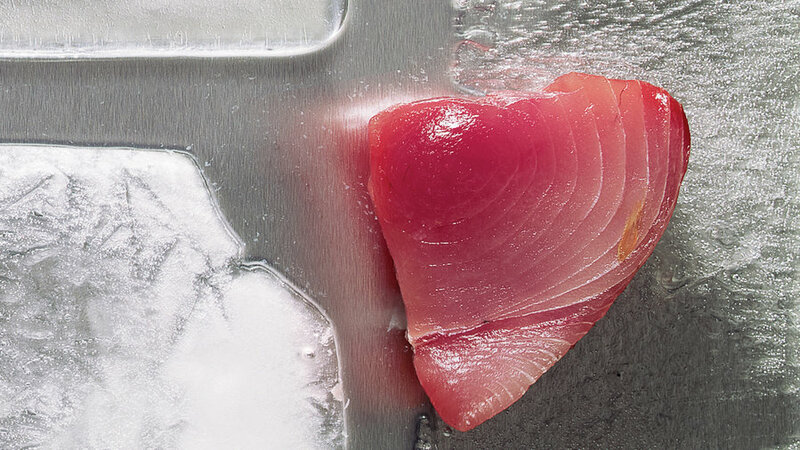 Limit servings of fresh bluefin or ahi (yellowfin or bigeye) tuna and fresh and canned longline-caught albacore, as these fish contain a lot more mercury. Although fish is in general a very healthful food, some varieties contain high levels of mercury, and most kinds contain at least trace amounts. Mercury is a naturally occurring poisonous metal that is released into the environment from industrial sources. When mercury accumulates in waterways, fish ingest it, and it builds up in their tissues. Trace amounts of mercury aren’t of concern to most healthy people. But high levels are a health risk for everyone, especially fetuses, infants, and young children, as mercury targets developing nervous systems and kidneys. You can’t trim or cook out mercury from fish. The Food and Drug Administration, the Environmental Defense Fund, and other organizations advise us to limit mercury by following these guidelines. DON’T eat the “big four” fish with the highest levels of mercury: king mackerel, shark, swordfish, and tilefish. DO eat up to 12 ounces a week of low-mercury fish and shellfish. Good choices include catfish, herring, oysters, pollock, salmon, sardines, shrimp, and tilapia. DO think small and low on the food chain. Fish such as sardines and anchovies reproduce quickly and become food for bigger fish, so they don’t have a chance to bioaccumulate much mercury. Larger, long-living, and predatory fish such as swordfish, shark, orange roughy, and older tuna tend to accumulate more mercury. DO be smart about tuna. Look for troll- or pole-caught fresh or canned albacore from the Pacific United States. Limit servings of fresh bluefin or ahi (yellowfin or bigeye) tuna as well as both fresh and canned longline-caught albacore; these these tuna tend to be older when caught, and so have accumulated more mercury than the young Pacific (West Coast) albacore. PCBs are industrial chemicals that accumulate in rivers and coastal areas. Fish that live in these areas can build up PCBs in their fatty tissue, and, in turn, humans who eat those fish can also build up PCBs in their fatty tissue. The problem? These substances are considered “likely human carcinogens.” Lab animals exposed to high levels have shown damage to circulatory, nervous, immune, endocrine, and digestive systems. Limit your exposure to PCBs by trimming the skin and fat from raw and cooked fish and avoiding fried fish. Bluefin tuna―Avoid; men can eat 1/2 serving per month. Rockfish―Eat no more than two meals per month. Sole (English)―Eat no more than three meals per month; two meals per month for ages 11 and under. Rainbow trout―Eat no more than three meals per month; two meals per month for ages 5 and under. Farmed (also known as Atlantic) salmon―Eat no more than one meal per month; 1/2 meal for ages 5 and under. Wild salmon (Alaska) ― Adults can eat four meals per month; no more than four per month for ages 5 and under. Wild salmon (Washington)―Eat no more than one meal per month; 1/2 meal for ages 5 and under. Health alerts: How many meals are safe to eat per month?